Fisher Parrish Gallery is pleased to present CHIMERA, an exhibition of painting and sculptural works by Hanna Eshel, Rainen Knecht, Emma Kohlmann, Diana Lozano, Jillian Mayer, Bridget Mullen, Adrianne Rubenstein and Katie Stout. Through the use of intuitive processes, bold marks and brightly colored textures, each artist deconstructs the gendered implications of decoration and ornamentality, using forms and surfaces as deceptive vehicles for the emergence of radical impulses. Adrianne Rubenstein’s gestural paintings depict playful subjects like rainbows, flowers and butterflies—things a 12-year-old girl would dream of—with a similarly raw innocence in her approach to paint on canvas. Her compositions are distinctly unselfconscious and sensually rich, with quick, shifting marks that bend and pulsate. 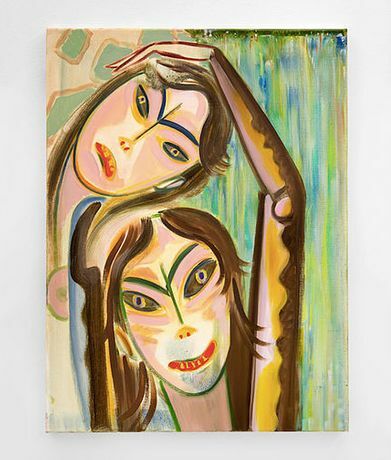 As dreamy, but rather eerier are Rainen Knecht’s dark cast of female characters, who flash toothy, hysterical grins from awkward postures fit tightly within the canvas. They seem to be born from an obscure fairy tale, complete with witch but sans the damsel in distress. Across Bridget Mullen’s layered canvas a cartoonish gaggle of female figures repeat, suggesting movement and time, and implying a perpetual state of becoming. Emma Kohlman’s fluid watercolors depict soft bodies reaching for each other while staring impassively at their audience from a colorful canvas. They are intimate and sensual but comically deadpan, bending into forms like vases, leaves and butterflies, which suggest a sort of narrative symbolism. There is a unifying sense of vulnerable physicality in the works, whether by physically posturing their user into awkward interaction, or by modeling this uneasiness through depictions of other bodies. Crouching, pastel women contort themselves into usefulness in Katie Stout’s chainsaw-carved bench. Known for her droll and absurdist depictions of female bodies morphing into furniture, her work is both grotesque and exuberant. Jillian Meyer’s Slumpies take a similarly cheeky approach to sculpture and its engagement with the body. Vivid and glittery, as though painted with nail polish, the colorful and clumsily-rendered Slumpies welcome users to sit, recline, or rest on them in postures best suited for staring at your iPhone in a simultaneous invitation to engage the body yet disengage from reality. Although colorful, bright, and at times humorous, these works remain deeply personal and intimate—they reference loss, personal experience, memory and desire. Through fantasy and play, they illustrate a dark reality. Diana Lozano’s botanical imitations and surrealist renderings of femme accessories redefine ornamentality and symbolic assignation as manifestations of suppressed sensory desires. Each sculpture utilizes symbolic associations to illustrate a deeply personal narrative while deconstructing the complexities of cultural identity and fetishized object-hood. Hanna Eshel’s burlap paintings take a more formal approach to a graphic and fetishized feminine symbolism. Painted nearly a decade before ‘feminist art’ had surfaced in Europe and the United States, Eshel’s neon-red slits in her paintings’ burlap surfaces serve as perhaps a more subtle predecessor—grounded in a more earthly as opposed to surreal depiction of the feminine mystique. Like its eponymous female fire-breathing Greek mythical creature, CHIMERA presents a fantasy of disparate parts of female identity as seen by 8 artists. Using intuitive and gestural techniques, these works compose a uniquely complex character that is both playfully humorous and intimately vulnerable.